This was my first attempt at spaghetti squash. It came out really delicious. The fresh ingredients are definitely the key. I did not even do any research into the spaghetti squash, except for how to cook it, before diving into this recipe, and I was pleasantly surprised at how good it came out. Initially I was brainstorming ideas on what other things my son would like, he absolutely loves pasta of any kind, so I was trying to think of something a little more healthy. He could not get enough of this dish. It was a big hit. Pierce butternut squash with a fork and either cook in the microwave on high for 5-6 minutes per pound, or roast in the oven, whole for 30-40 minutes per pound, or until tender. The skin of the butternut squash is very thick and difficult to cut, so I just cook the whole squash, and then remove the seeds after cooking. For this recipe I used the microwave, and it worked great. When the squash is tender, remove and cut in half and remove the seeds of the squash. 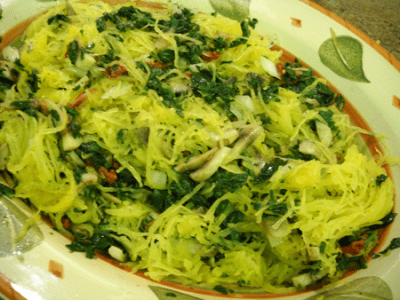 Place shredded spaghetti squash in a large pasta bowl. Then preheat a large skillet. Drizzle with olive oil, add onions, mushrooms and a little kosher salt. Saute until softened. Add garlic and wilt in spinach. Then add a little more kosher salt and the sun-dried tomatoes. Melt in butter and add vegetables to squash. Serve with fresh bread. THIS is definitely getting made! YUM! .-= Katrina (gluten free gidget)´s last blog, KEFIR! Gesundheit… =-. made this tonight ! after reading this the other day I knew I had to try. It came out perfect. In the past I have tried to hack the spaghetti squash open before cooking it. I really really liked microwaving it first, it was SO much easier. Thanks! .-= Nicole´s last blog, Biggest Loser Time! =-.